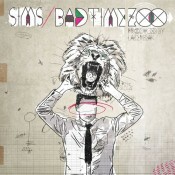 Bad Time Zoo is the second full-length record from Doomtree Emcee, Sims. It’s his best work to date–a culmination of his talents as an emcee, imaginative lyricist, and thoughtful commentator on American culture. Lazerbeak made every beat on the album; his larger-than-life production features spine-cracking snares, full-tilt horn sections, and catchy synth lines. This release is a double gatefold LP, limited, first pressing of 500. LP includes CD artwork insert and additional shark cut-out insert. Every record comes with a digital download card. Artwork was designed by Adam Garcia.